Fall is (almost) HERE! Come Birding! Fall is here! Okay, so the Autumn Equinox is still weeks away, but we all know that bird migration happens year-round, and what we consider "fall migration", the southbound movement of billions of birds each year, begins in earnest while tens of thousands of tourists are still flocking to our summer beaches. But recently we've had some drier winds from the northwest, we've even seen cooler temperatures showing up farther north, albeit from our weather apps and weather stations, but it's still clear as day that fall is indeed coming, even if it's not officially here. A few offshore storms are setting the surfers into overdrive as well, and birders anxiously await anything pelagic that might blow in. 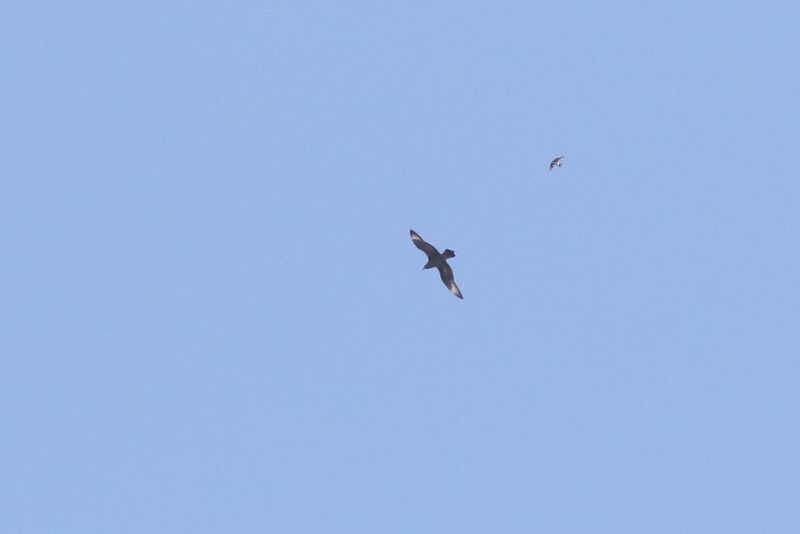 This is also the time for Jaegers to begin their southbound movement out of the Arctic breeding grounds and down both coasts, so seeing a jaeger offshore of Cape May now isn't rare at all, but seeing one overhead, over land, is always a head-scratcher and draws some excitement. So today when the alert came out that a Jaeger species was soaring over Stevens Street with Turkey Vultures, I had to smile and think "yup, Cape May!" Here's a photo of the bird, with a Tree Swallow, taken by the original observer and resident of Stevens Street, Michael O'Brien. Michael later confirmed that this was indeed a young Parasitic Jaeger, the "expected" jaeger species from shore here in Cape May. Juvenile Parasitic Jaeger soaring overhead with a Tree Swallow above it. 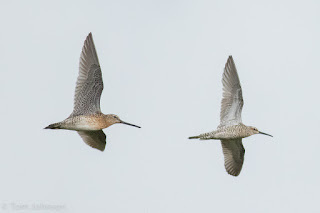 Stilt Sandpipers are moving through Cape May right now and can be found most days in the freshwater marshes at the southern tip of the peninsula - especially the Meadows and Cape May Point State Park. While this species is highly distinctive and quite striking in breeding plumage, I still think of it as a "tweener" shorebird - a species that can be easily mistaken at a glance for a few other species (Pectoral Sandpiper is another such "tweener" shorebird, easily mistaken for Least Sandpiper, Ruff, and others depending on the context, distance, etc). In this case, flocks of yellowlegs and dowitchers can easily provide "cover" for Stilt Sandpipers. With a careful look at the structure, colors, and size of Stilts, they become much easier to pick out of flocks. July-August is when adult Stilt Sandpipers molt from their dark-barred alternate (breeding) plumage into the duller basic (winter) plumage. 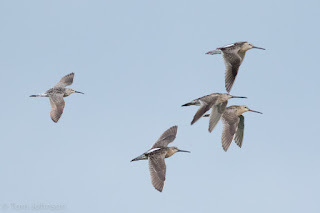 This flock of adults still shows plenty of heavy barring across on the underparts; among our American shorebirds, this pattern is unique to Stilt Sandpiper. 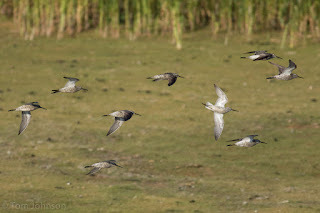 The slim shape and gray and white colors may recall the pattern of yellowlegs, but these Stilt Sandpipers in their unbarred, basic plumage are more compact in wing shape and overall length. 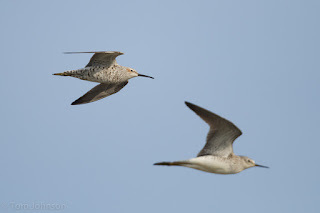 The underwing pattern, a white stripe on the underwing coverts isolated in gray, helps set the species apart from yellowlegs and dowitchers which have more evenly patterned underwings. This photo of a Stilt Sandpiper (left) with a Lesser Yellowlegs (out of focus at right) gives an idea of the relative shape and size of these two species. The yellowlegs is relatively leggy and shorter-billed than the sandpiper. 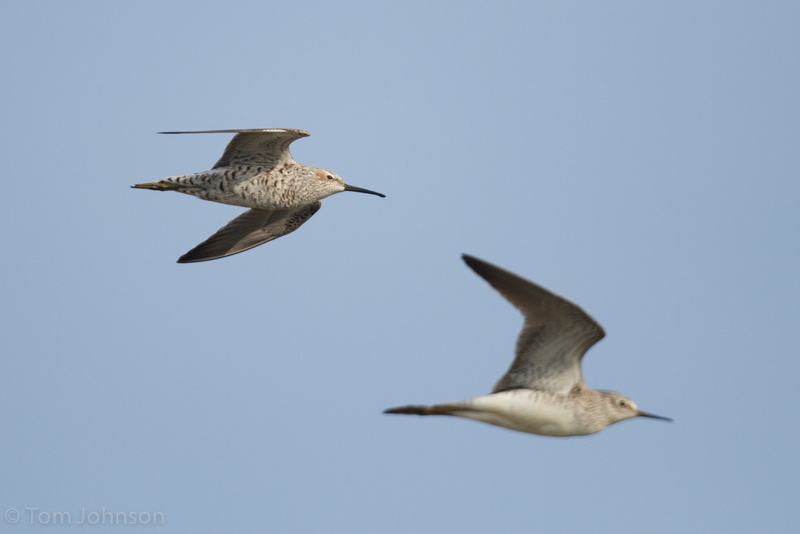 You can also see the underwing of the yellowlegs, which is more uniformly pale/ evenly barred than a Stilt Sandpiper. 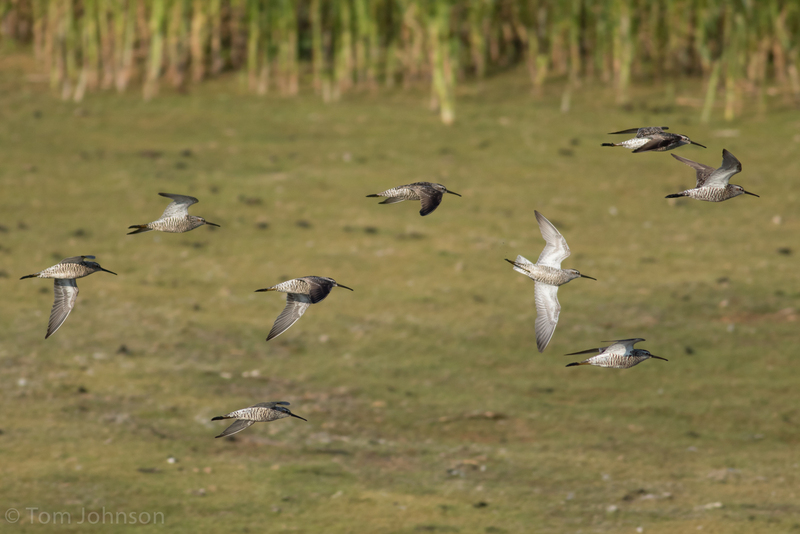 Stilt Sandpipers often feed in deeper water with Short-billed Dowitchers, and so you often see the two species together in flight. Note the slim shape of the Stilt Sandpiper's body and wings, the leg projection beyond the tail, and the slightly droopy bill. Compare the isolated white stripe in the middle of the underwing of the Stilt Sandpiper to the evenly barred underwing of the dowitcher. Of course, dowitchers (of both species) show an obvious white stripe running up the back, which Stilt Sandpipers lack. Here, a Stilt Sandpiper (at left) shows off its pale hind end and dark back, strikingly different from the high contrast backs of the four Short-billed Dowitchers. Mike Kilpatrick operates a nature photography guide service specializing in New Jersey coastal marsh and seashore subjects. A life-long resident of North Wildwood, NJ his work has appeared in national publications, including Nature Conservancy and Ducks Unlimited. The main event of salt marsh bird life in the summer is the nesting season of colonial gulls and terns. 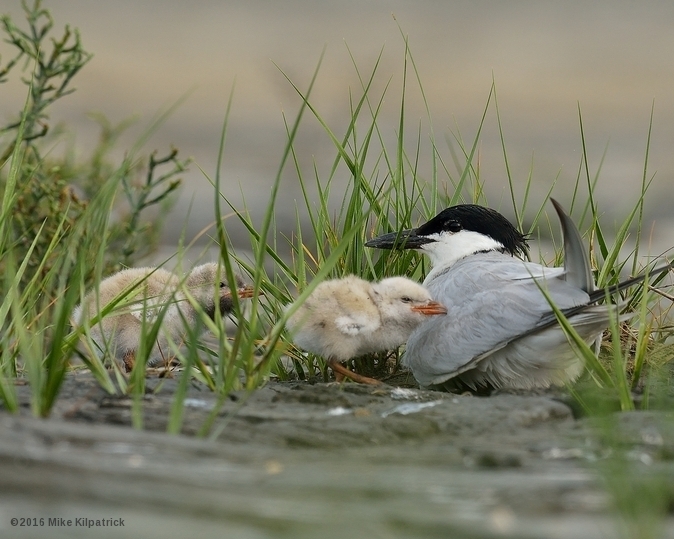 Colonies of Laughing Gulls, Forster’s Terns and Common Terns are strung along the tidal waterways behind the Atlantic coast barrier islands, where nests can be found in very high density. Laughing Gull with chicks, nesting in wrack on marsh edge. In order to avoid losing nests to tides, the gulls and terns tend to nest on wrack. Wrack forms as the tide ebbs and flows across the marsh, pushed into masses of dead reeds. It accumulates in, and along, the taller grass boarders of breached ponds and creeks and forms slightly raised platforms used to support nests. Predominant among the wrack nesters is the Laughing Gull and Forster’s Tern. Pair of Forster's Terns at the nest. Less frequent is the common tern being more associated with beach nesting colonies yet they join the wrack nesting community with enough frequency that finding a few nesting on the marsh is not a surprise. Common Tern nest in wrack. Amidst the colony drama created by many thousands of birds spread across a vast area, it is easy to overlook a rare player whose appearance on the stage is fleeting: The Gull-billed Tern. 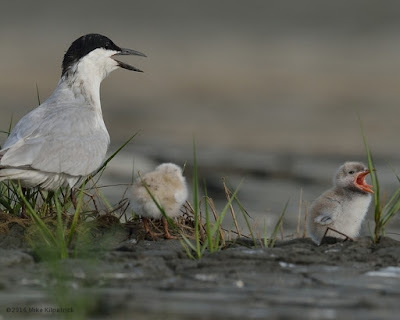 It, like the common tern, is more often associated with beach nesting locations but it is a nomadic and adaptable bird that has shown throughout its range a diversity of nesting locations including the marsh. Once known as “The Marsh Tern”, nesting records in New Jersey, at the northern edge of its range, are sporadic. On the Cape May Peninsula, such records are few and far between. But exist they do, as I discovered this past season. I was tucked in the tall grass edge of a breached pond in pursuit of photos with clear views of a line of Laughing Gulls and Forster’s Terns nesting along a small creek west of Stone Harbor/Avalon. The colony soon forgot me and I watched parent birds tend to their nesting cuties. The chorus of calls around me included Laughing Gulls and Forster’s Terns along with an intermittent Clapper Rail, passing egrets and Herring Gulls. A second tern voice emerged in the background: a Common Tern. Then there was another addition to the choir, a different voice, it was a Gull-billed Tern. As my attention turned to this voice, it became a consistent presence in the marsh chorus. It was not just one bird. It was with excitement that I set out to locate the source of these voices. One Gull-billed Tern passing overhead turned into another and then two more passed overhead. Following their flight, they appeared to be landing and rising from the same spot. 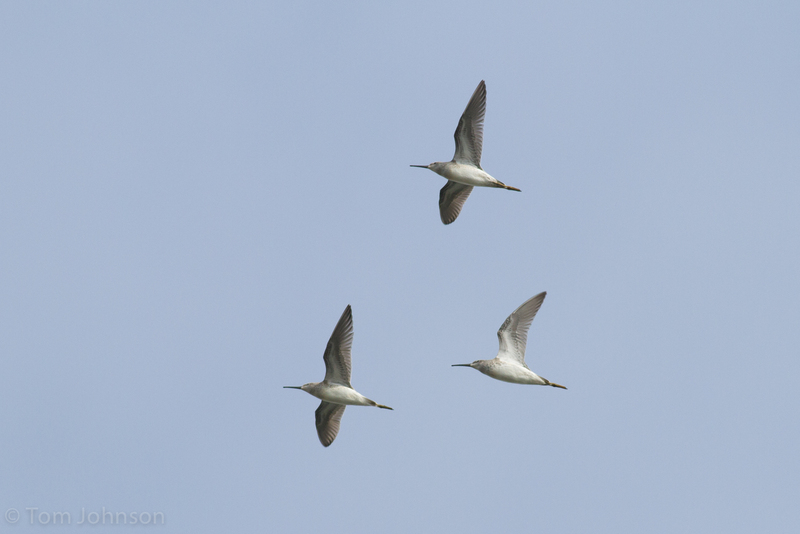 When a passing Herring Gull was quickly met by a mob of Common and Gull-billed Terns rising off the marsh, I had one thought: “Nesting?” When finally approaching this area, it was apparent. On a mat of wrack there were twenty-one Gull-billed Terns with eight nests along with nests of Common Terns present in slightly higher numbers. Gull-billed Tern and chick exchanging calls. That afternoon, I embarked on an obsessed search of the literature, as books flung from the shelf began to form chaotic piles upon the floor. I uncovered a timeline spanning hundreds of years of natural history observations, starting with writings of Philadelphia Naturalist William Bartram in the 1700’s through recent sightings on eBird. Across the observations of naturalists and plume hunters and information contained in modern research papers and state survey records, one conclusive truth emerged. 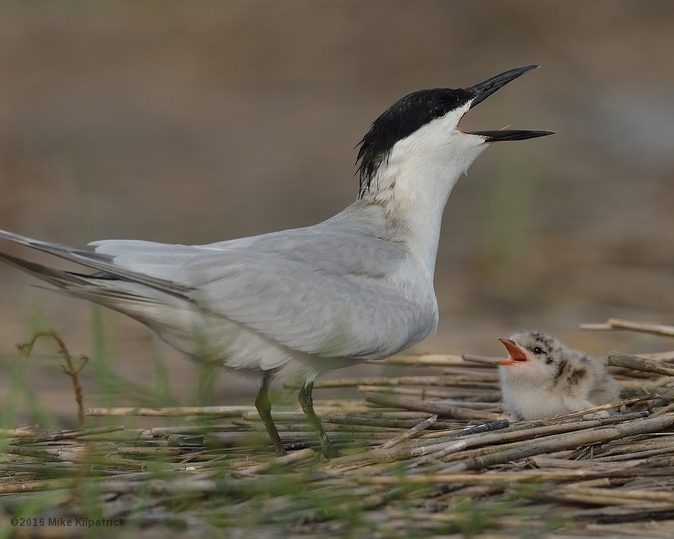 There is very little information about the Gull-billed Tern nesting in Cape May County. Gull-billed Tern driving off a Laughing Gull chick from its territory. The island he references is the Seven-mile Beach Island, know better today as Stone Harbor and Avalon, described by Shick as “one of the richest ornithological fields open to collectors.” It is interesting that Witmer Stone, in his iconic “Bird Studies of Old Cape May” leans toward discrediting Shick’s account of the gull-billed tern. Yet, on the morning of July 2, 2016, as I stood on a marsh island behind Stone Harbor and Avalon, the gull-billed tern was present and nesting, surrounded by Larus atricilla (laughing gull). The stately Gull-billed Tern showing of its namesake feature. The 19th century records are complimented with two other references confirming nesting in Cape May County. 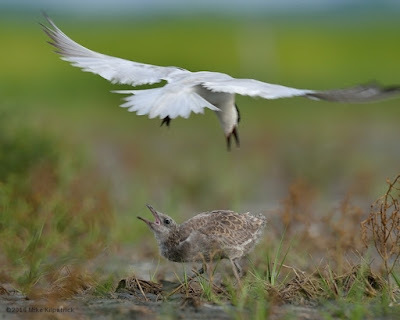 The US Fish and Wildlife Service Status Review and Conservation Recommendations for the Gull-billed Tern in North America notes no research studies specific to the Gull-billed Tern have been conducted in New Jersey other than annual aerial censuses of mixed gull and tern colonies. Still, very few nests are actually discovered despite this bird being an annual breeder. Clay and Pat Sutton make reference in Birds and Birding at Cape May of two pairs nesting on Stone Harbor Point in 2003. 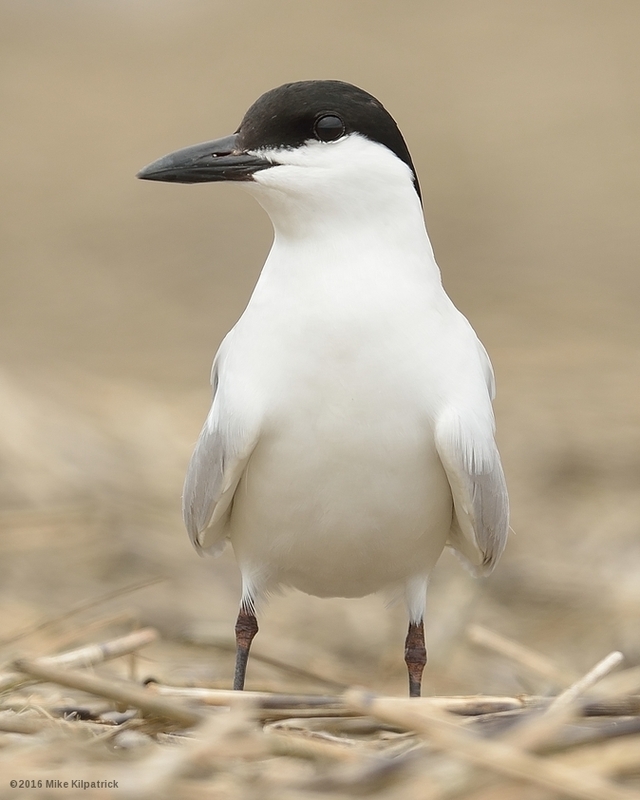 The lack of accessible references about the Gull-billed Tern on the Cape May Peninsula may not represent the entirety of what is, or was known. It is likely that only a fraction of what was observed regularly makes it into the public record. Today we have the luxury of advanced tools and technology that allows all of us to participate and contribute, at any level, to the ever evolving ornithological record. From novice to expert, from research scientist to casual vacationer, from birder to photographer to fisherman to hunter, thanks to citizen science tools like eBird, the ornithological record now accommodates participation. As a result, in the future this record will be much more complete. It’s always a memorable moment when a Gull-billed tern crosses over head and it is certainly exciting to find them nesting in Cape May County. It is also thrilling to take a journey through the ever evolving ornithological record: combing through historic references, the experience of the present moment (as mine on the morning of July 2nd), and imagining someone 100 years in the future creating their own map of discovery from the references recorded today. Editor's Note: Annual aerial surveys by the State of New Jersey do detect Gull-billed Terns each year in the marshes from Stone Harbor northward. Their low-density nesting does indeed make them harder to find than other species. For those interested seeing more of these marsh breeding species, our Birding by Boat trip on The Osprey and/or The Skimmer Salt Marsh Safari are both highly recommended.